Melting or softening the material to produce the layers: thermoplastics (e.g. PLA, ABS), polyamide (nylon), RTV silicone, porcelain, metal clay, titanium alloys, cobalt chrome alloys, stainless steel, aluminum, metal powders, ceramic powders. Curing liquid materials like Photopolymers. Shaping and joining together thin layers (paper, polymer, metal foil, plastic film) – used in laminated object manufacturing. 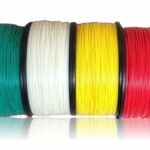 If you are looking to compare prices of 3D filaments click here.